The best steamed mussels ever! This Thai mussel recipe makes an incredible appetizer or a romantic dinner for two. 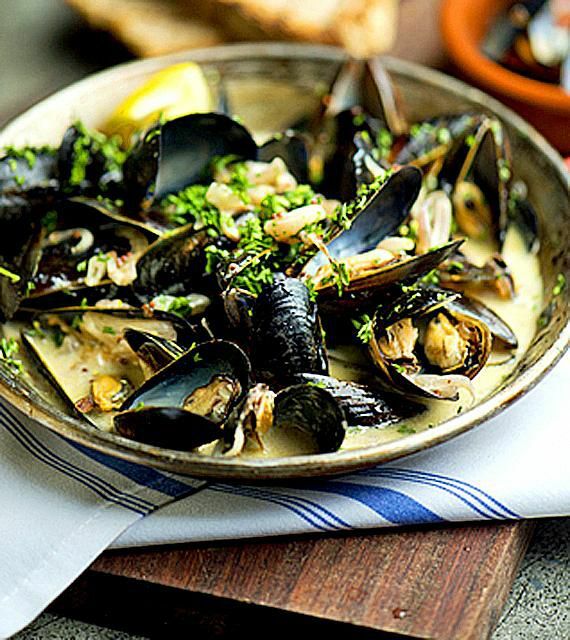 Fresh mussels are steamed in white wine, then lightly simmered in a basil-coconut sauce that's simply divine. The dish is finished off with more basil and fresh coriander. Serve with your favorite wine and a loaf of crusty French bread to soak up the juices. Enjoy! Rinse mussels under cold water. Set in refrigerator until ready to use. Place all 'Basil-Coconut Sauce' ingredients in a food processor. Process well. Taste test for salt, adding more fish sauce if not salty enough. If too salty for your taste, add a little more lime juice. Add more chili for a spicier sauce. Set aside. Heat a large frying pan or wok over high heat. Add 1-2 Tbsp. oil and swirl around, then add the galangal or ginger, shallots or onion, garlic and chili (if using). Stir-fry 2 minutes. Add white wine and mussels, stirring gently. Bring to a boil. Reduce heat to simmer (medium-low) and cover with lid to steam 3 minutes. Take off lid and stir gently. If most of the mussels have opened, they are ready to eat. Discard the ones that haven't opened. Reduce heat to low. Remove lid and add the basil-coconut sauce. Stir gently. As soon as the sauce is warm, this dish is ready (30 seconds to 1 minute). To serve, slide mussels and sauce onto a serving platter, mounding them into a pile. Sprinkle with chopped basil and fresh coriander. If desired, serve with a fresh French loaf, or garlic toast to soak up the juices. Enjoy with a bottle of nice wine and a loved one!